Each month the International Aperture Accademy features a selected individual professional photographer on their website in the form of a question and answer interview. It is an opportunity to hear what other professional photographers have to say on various topics as well as being an outlet for them to tell their personal story and discuss interesting elements of their photographic career. In August this year Art Wolfe who has been one of my personal inspirations was featured on the Academies website and I am pleased to announce that I am following on as the September Photographer of the Month. My feature and interview is available HERE. 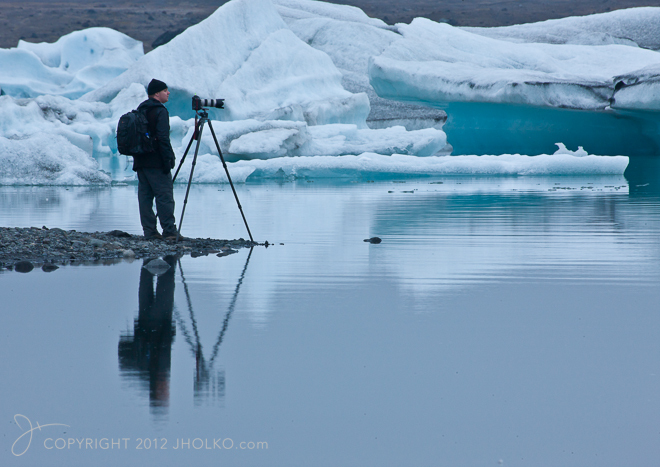 The photograph below was taken at the Jokulsarlon glacial lagoon in Iceland during my trip last year and was provided courtesy of Tim Gray Photography. Tim, you caught me in a moment of contemplation in this frame – It is one that holds wonderful memories of the time I spent at the lagoon.